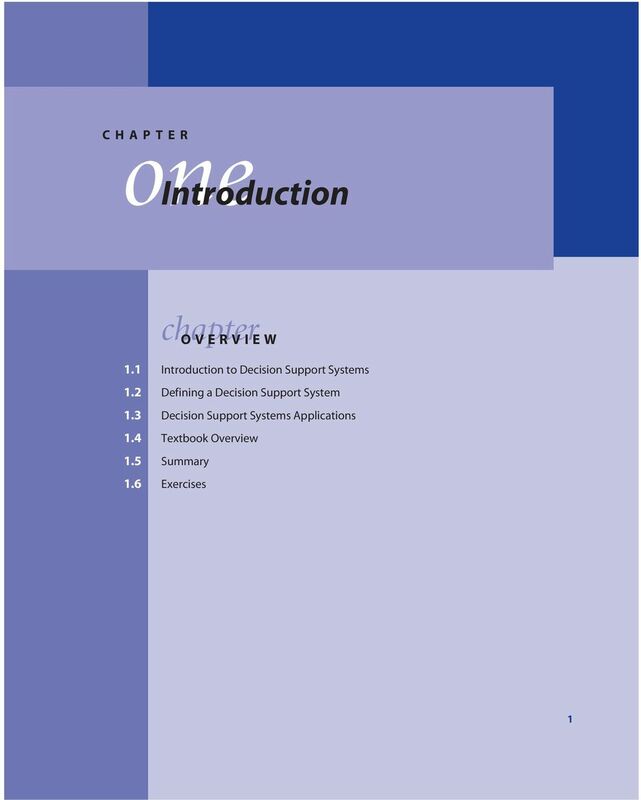 Download "one Introduction chapter OVERVIEW CHAPTER"
3 SECTION 1.2 Defining a Decision Support System 3 which fairly sophisticated DSS applications can be built. This book imparts the skills needed to build such systems. 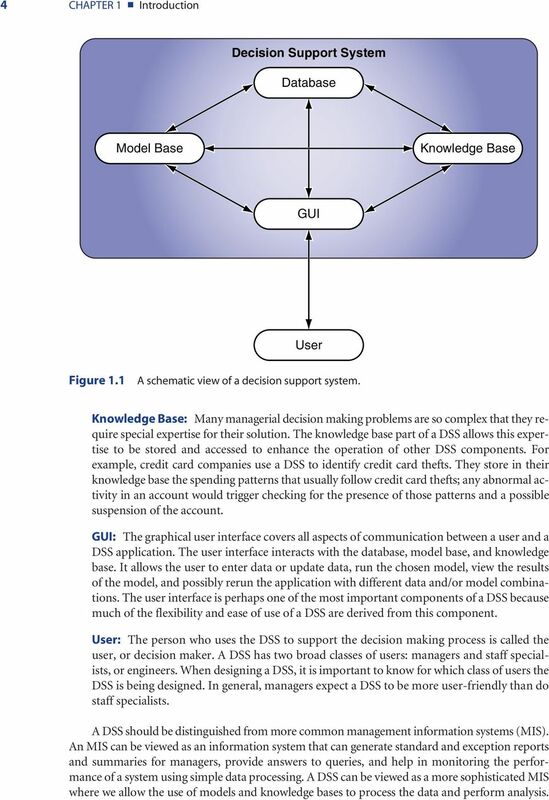 1.2 Defining a Decision Support System A decision support system is a model-based or knowledge-based system intended to support managerial decision making in semi-structured or unstructured situations (Turban and Aronson, 2001). A DSS is not meant to replace a decision maker, but to extend his/her decision making capabilities. It uses data, provides a clear user interface, and can incorporate the decision maker s own insights. Some of the major DSS capabilities are the following: 1. 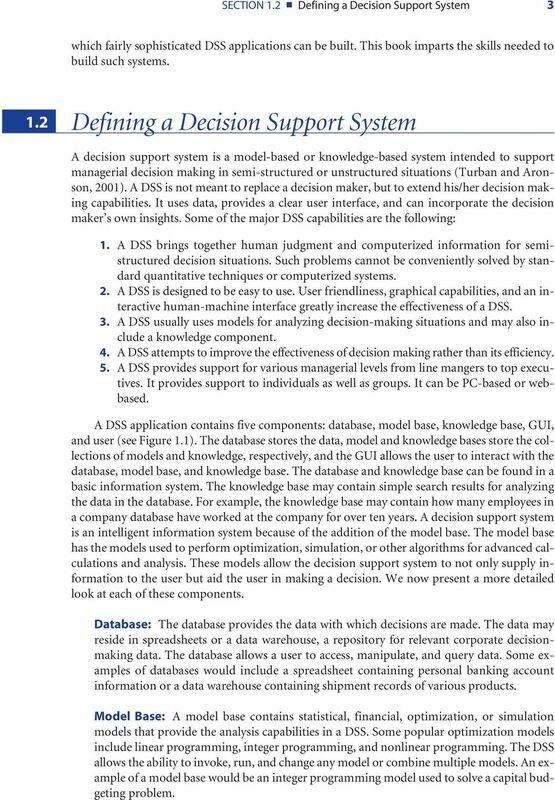 A DSS brings together human judgment and computerized information for semistructured decision situations. Such problems cannot be conveniently solved by standard quantitative techniques or computerized systems. 2. A DSS is designed to be easy to use. User friendliness, graphical capabilities, and an interactive human-machine interface greatly increase the effectiveness of a DSS. 3. A DSS usually uses models for analyzing decision-making situations and may also include a knowledge component. 4. A DSS attempts to improve the effectiveness of decision making rather than its efficiency. 5. A DSS provides support for various managerial levels from line mangers to top executives. It provides support to individuals as well as groups. It can be PC-based or webbased. A DSS application contains five components: database, model base, knowledge base, GUI, and user (see Figure 1.1). The database stores the data, model and knowledge bases store the collections of models and knowledge, respectively, and the GUI allows the user to interact with the database, model base, and knowledge base. The database and knowledge base can be found in a basic information system. The knowledge base may contain simple search results for analyzing the data in the database. For example, the knowledge base may contain how many employees in a company database have worked at the company for over ten years. A decision support system is an intelligent information system because of the addition of the model base. The model base has the models used to perform optimization, simulation, or other algorithms for advanced calculations and analysis. These models allow the decision support system to not only supply information to the user but aid the user in making a decision. We now present a more detailed look at each of these components. Database: The database provides the data with which decisions are made. The data may reside in spreadsheets or a data warehouse, a repository for relevant corporate decisionmaking data. The database allows a user to access, manipulate, and query data. Some examples of databases would include a spreadsheet containing personal banking account information or a data warehouse containing shipment records of various products. Model Base: A model base contains statistical, financial, optimization, or simulation models that provide the analysis capabilities in a DSS. Some popular optimization models include linear programming, integer programming, and nonlinear programming. The DSS allows the ability to invoke, run, and change any model or combine multiple models. An example of a model base would be an integer programming model used to solve a capital budgeting problem. 4 4 CHAPTER 1 Introduction Decision Support System Database Model Base Knowledge Base GUI User Figure 1.1 A schematic view of a decision support system. Knowledge Base: Many managerial decision making problems are so complex that they require special expertise for their solution. The knowledge base part of a DSS allows this expertise to be stored and accessed to enhance the operation of other DSS components. For example, credit card companies use a DSS to identify credit card thefts. They store in their knowledge base the spending patterns that usually follow credit card thefts; any abnormal activity in an account would trigger checking for the presence of those patterns and a possible suspension of the account. GUI: The graphical user interface covers all aspects of communication between a user and a DSS application. The user interface interacts with the database, model base, and knowledge base. It allows the user to enter data or update data, run the chosen model, view the results of the model, and possibly rerun the application with different data and/or model combinations. The user interface is perhaps one of the most important components of a DSS because much of the flexibility and ease of use of a DSS are derived from this component. User: The person who uses the DSS to support the decision making process is called the user, or decision maker. A DSS has two broad classes of users: managers and staff specialists, or engineers. When designing a DSS, it is important to know for which class of users the DSS is being designed. In general, managers expect a DSS to be more user-friendly than do staff specialists. A DSS should be distinguished from more common management information systems (MIS). An MIS can be viewed as an information system that can generate standard and exception reports and summaries for managers, provide answers to queries, and help in monitoring the performance of a system using simple data processing. A DSS can be viewed as a more sophisticated MIS where we allow the use of models and knowledge bases to process the data and perform analysis. 5 SECTION 1.3 Decision Support Systems Applications Decision Support Systems Applications Given the above definition of a decision support system, we have developed several spreadsheetbased DSS applications in Excel. Using the spreadsheet functionality in Excel and the VBA programming capabilities, a complete decision support system can be developed. As an IE/OR or business graduate, students will discover opportunities in their careers to develop and use DSS applications. Many students who have taken DSS courses have reported that their skills of combining modeling with an information technology packaging have truly helped them be outstanding at their jobs. Let us consider two examples of DSS applications which may be found in industry. Car Production: Consider a factory which produces cars. The manager of the factory, probably a business or IE/OR graduate, may need to make some large-scale decisions about ordering parts, hiring/firing employees, finding new suppliers, or making changes to the production process. Let us focus on a production process DSS application. The manager may be deciding where to place a new piece of equipment or how to add a new product part to the production sequence. With the use of some basic simulation and analysis tools, one could develop a DSS which allows the manager to enter the parameters to describe a possible scenario and see how it would affect production. The manager may not want to know the details of the models used, but rather what would be the affect on cost and production time and quantity if a specific change was made. This is just one example of how a DSS could be used to aid in the car production industry. Railroad Car Management: Consider a railroad company which owns several trains on which they place several thousand railroad cars which ship to several cities in the country. A distribution manager, again with an IE/OR or business background, may need to decide which cars should go on which trains to which cities. He would benefit from using an optimization model which allows him to modify certain constraints or focus on various objectives and compare the resulting distribution plans. He may want to display the car and train plans visually, may be projected on a country map, to have a better understanding of the effects of one solution compared to another. A DSS would aid him in accomplishing this analysis and making a decision which considers all scenarios and possible outcomes. The applications we develop are basic illustrations of decisions which are made in IE/OR and business industries. Two examples, selected from the DSS applications developed in Part III of this book, are described below. Portfolio Management and Optimization: In this application, we allow users to create and/or edit their portfolio as well as optimize their investments. To create a portfolio, users can choose from a list of stocks in a database in Excel and add or remove them to/from their portfolio. The stocks are listed by name and category. These stocks can also be compared using their historical annual returns and changes in market price. Once users have created their portfolio, they may also edit it at any time. Users may then optimize their investment by specifying a desired return on their portfolio and the amount available for investing. The application then solves an optimization problem which minimizes users risk on their selected portfolio. The suggested investment strategy is then displayed to the users. This application allows users to interact with the database of stock information and the knowledge base of comparative statistics. The model base for this DSS uses the Excel Solver to perform an optimization which minimizes the user s risk on the portfolio investments. 8 8 CHAPTER 1 Introduction when interacting with the user. The programming principles discussed will help the reader avoid errors in the DSS coding. 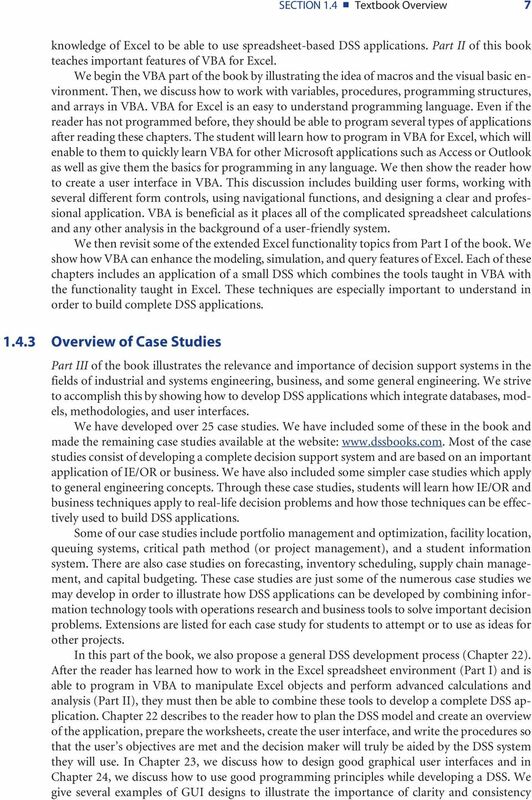 These are both important chapters for the reader to understand before developing complete DSS applications Overview of Appendices We have three Appendices chapters at the end of the book. The first chapter, Appendix A, gives an overview of various Excel Add-In programs. We review the Analysis Toolpack, covered in Chapters 7 and 9, and the Solver, covered in Chapter 8. We also explain how to use the Premium Solver and present a comparison between the Premium and Standard Solvers. We then give an overview of some statistical and simulation Add-Ins, Crystal Ball, and Stat- Tools. 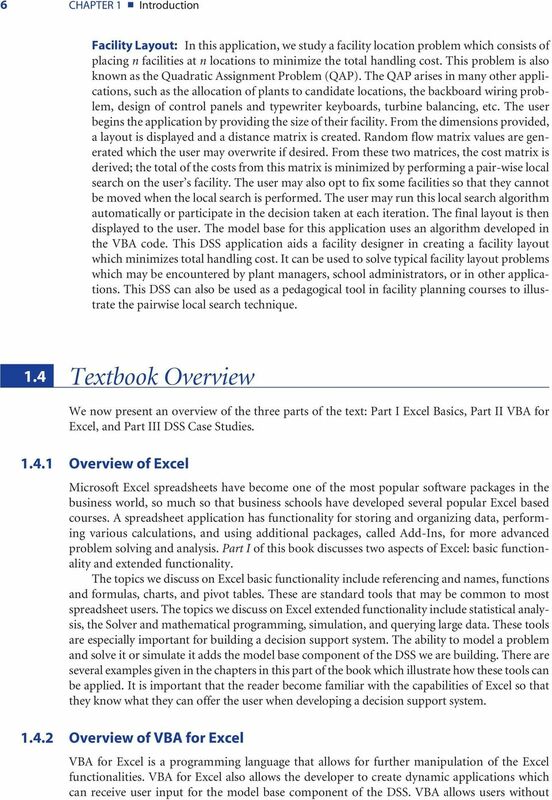 The next chapter, Appendix B, describes how to perform debugging and error checking in VBA for Excel. We present several methods that can be used to prevent errors and check for errors. 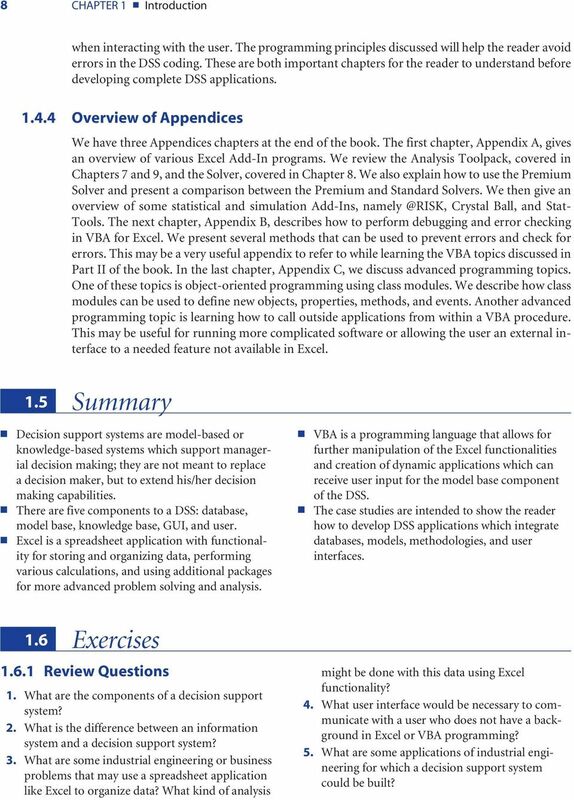 This may be a very useful appendix to refer to while learning the VBA topics discussed in Part II of the book. In the last chapter, Appendix C, we discuss advanced programming topics. One of these topics is object-oriented programming using class modules. We describe how class modules can be used to define new objects, properties, methods, and events. Another advanced programming topic is learning how to call outside applications from within a VBA procedure. This may be useful for running more complicated software or allowing the user an external interface to a needed feature not available in Excel. 1.5 Summary Decision support systems are model-based or knowledge-based systems which support managerial decision making; they are not meant to replace a decision maker, but to extend his/her decision making capabilities. There are five components to a DSS: database, model base, knowledge base, GUI, and user. Excel is a spreadsheet application with functionality for storing and organizing data, performing various calculations, and using additional packages for more advanced problem solving and analysis. VBA is a programming language that allows for further manipulation of the Excel functionalities and creation of dynamic applications which can receive user input for the model base component of the DSS. 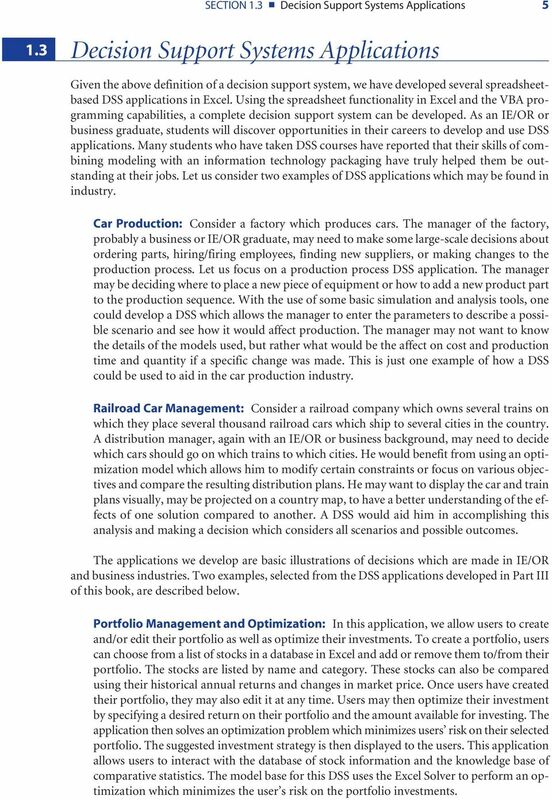 The case studies are intended to show the reader how to develop DSS applications which integrate databases, models, methodologies, and user interfaces. 1.6 Exercises Review Questions 1. What are the components of a decision support system? 2. What is the difference between an information system and a decision support system? 3. What are some industrial engineering or business problems that may use a spreadsheet application like Excel to organize data? What kind of analysis might be done with this data using Excel functionality? 4. What user interface would be necessary to communicate with a user who does not have a background in Excel or VBA programming? 5. 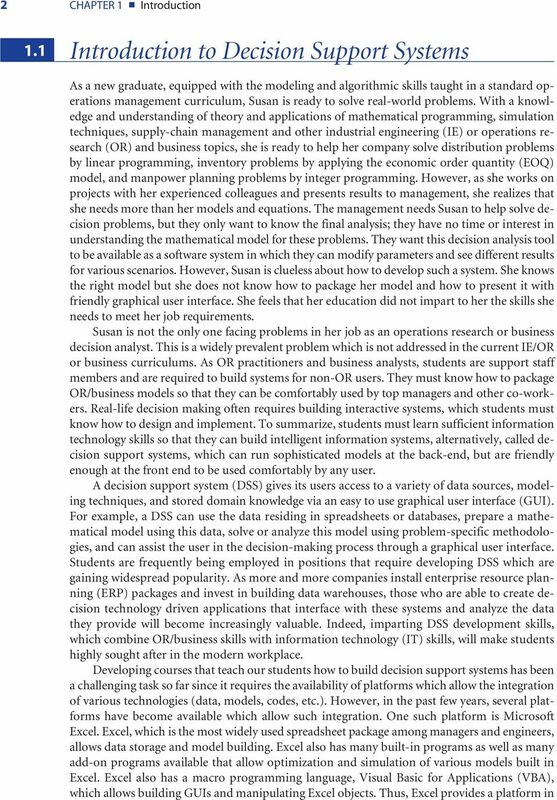 What are some applications of industrial engineering for which a decision support system could be built? Why is SAS/OR important? For whom is SAS/OR designed? Using Excel and VBA CHANDAN SENGUPTA SECOND EDITION. WILEY John Wiley & Sons, Inc.